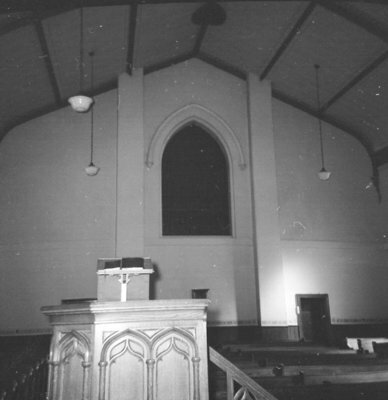 A black and white picture of the interior of St. Andrew's Presbyterian Church looking east. St. Andrew's Presbyterian Church was built in 1859 at the north west corner of Byron Street and St. John Street in Whitby. It served as a Presbyterian church until 1968. In 1993 the church was purchased and became the St. Arsenije Sremac Serbian Orthodox Church-School Congregation. St. Andrew's Presbyterian Church, February 5, 1966, Brian Winter. Archives A2013_004_167.